Michael has been trying to catch Tristan for years...to give him a second ticket. Suddenly faced with “Sparky”, all grown up and looking to get laid, Michael’s protective instinct kicks in—and presents him with an opportunity that’s hard to resist. After all, the kid must know what he’s getting into, so why not? Product Warnings: Contains high-octane hair, a clawfoot bathtub, and a story that will make you believe in love at first sight. Okay, second sight, but who’s counting? 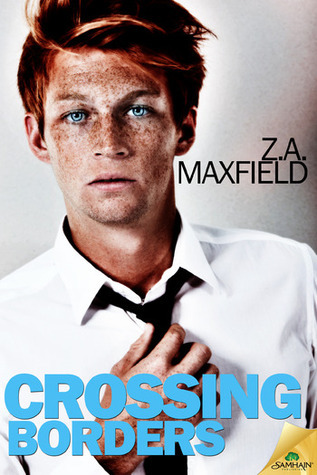 Crossing Borders was first published in 2007, with a different publisher and a very different cover. As ZA Maxfield pointed out in the Author’s note, the world was a much different place 8 years ago. People could still meet and fall in love in Borders and being gay often meant living without things like marriage and children. What’s more, being gay and a police officer was far more dangerous, although it still isn’t something to be taken lightly. Crossing Borders was one of my first M/M reads (which I suspect holds true for many readers) and as such, it holds a very special place in my heart. It tells the story of Tristan, a college student barely discovering that he’s gay, and Michael, a slightly older police officer who’s had his eye on the young man for ages, and for several different reasons. It also offers glimpses into their very different family lives, their different backgrounds and interests, and in the process, these two men slowly find common ground and build a strong, loving life together. Their romance is filled with both painful moments and humor, and Maxfield is one of those rare authors who can balance the two perfectly. Caring for these characters is never a problem - their preoccupations, lifestyle, values and fears soon become just as important to us as they are to them. I’ve read several novels by ZA Maxfield, and they all have superb characterization in common. What’s more, I love that the struggles of this couple were always very realistic and down to earth. There is some drama and the painful moments are truly heart-wrenching, but they always rang true to me, and each problem Tristan and Michael faced was something I could easily see happening in real life. Maxfield offered no easy fixes; sacrifices had to be made on both sides, but they all lead to a sweet and reasonable ending. If there’s such a thing as a classic in a genre as new as M/M lit, Crossing Border definitely fits the bill. The details may be a bit outdated, but the love story within its pages is timeless. This was my third time reading it, but I think I have a few more rereads left in me somewhere down the road. If on the third re-read it still holds well and gets 4 stars... then it really has to be good! Wow, you've read it three times? That's awesome. I have this one to review- I didn't know it was released so long ago (well, you know what you mean) so that's good to know! Thanks for sharing, Oh, and I see you're currently reading Tigers on the Run. i really need to read that - Love those books. It is amazing to see how far we have come with our mindset in just the last eight years. I am glad this one held up for your reread. A bookstore ... what's that? ;) Seriously though, this sounds like a great book, and I love that these older LGBT books will hit a wider audience. I bet that it still applies to areas to different countries even if things have changed for the better. It is amazing how much has changed in those 8 years, but then again it should have been better 8 years ago. Okay, focus on the positive and I'm glad it is different now. Well if you've read it 3 times already, that is certainly saying something! This sounds like such a beautiful novel and totally touching. I shall check it out on the Goodreads now! Their relationship sounds like it has been beautifully done so I am looking forward to meeting these characters in the future! It's possible that I will to Disney land and visit the US for the first time this year and I wished I could go to a borders. I heard lovely things. Maybe it's just other ppl 's nostalgia speaking.